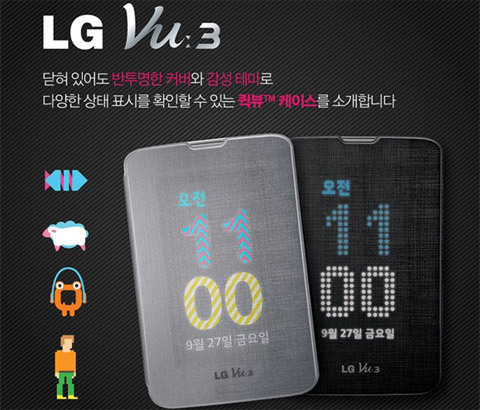 According to Korean media outlet etnews, LG is preparing to launch the Vu 3 in October as a direct rival to the Samsung Galaxy Note 3. In addition, LG has teased a couple of specially made cases for the phone hinting its almost ready for prime time. The LG Vu 3 is said to be cheaper than its predecessor despite the updated innards inside it. According to the Korean sources, the third-generation boxy phablet from LG will flaunt a 5.2" 4:3 display of 1280 x 960 pixels resolution. The LG Optimus Vu II successor will be powered by a Snapdragon 800 chipset, which is arguably the most potent performer on the market right now. Furthermore, the Vu 3 is said to feature a 13-megapixel rear camera and support for the fastest LTE-A networks. The LG Vu 3 will launch in South Korea for the KT Telecom (with a model number F300k), LGU+ telecom (F300l) as well as SK telecom (F300s). 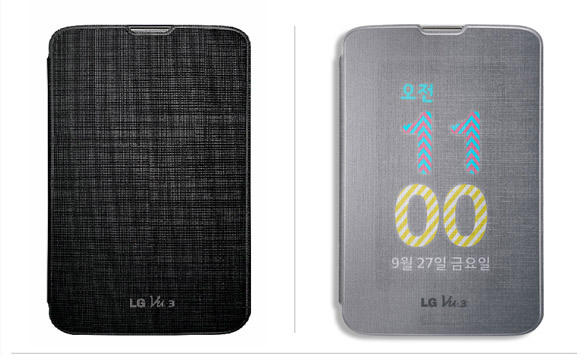 As for the cases that LG teased on its Facebook page they are dubbed QuickView and will be available in black and grey. You shouldn't mistake them with the LG G2 QuickWindow cases, as the LG Vu 3's QuickView case is quite different and a lot cooler. It's front cover is semi-transparent, which allows the primary displays to be put in an ingenious use. Incoming notifications can be showed on the whole fascia of the case, without compromising the security of the display itself. Follow the second source link below for a cool animation on how the case works. LG is expected to officially announce the Vu 3 and its accessories in the next couple of weeks. I got the LG L9 first and then I got the Vu 2 which is a stretched version of L9. I don't know why but for some Reason, I'm loving the Vu 2 the same with the L9. When you have the Vu 2 or any Vu phone, you'll know what I'm saying.